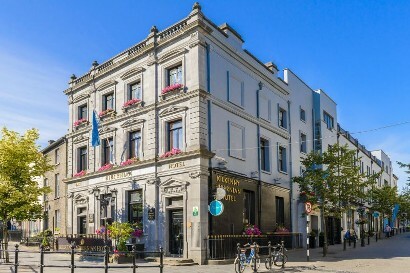 Perfectly located in the centre of the Marble City, close to popular attractions like Kilkenny Castle, the Smithwick’s experience and a host of great shops and restaurants, is the fabulous Kilkenny Hibernian Hotel. A classic imposing building, which in days of yore was the old Hibernian Bank, it was beautifully restored and maintained, and is the perfect base from which to explore the cobbled streets and medieval architecture that attract so many people to the county of cats. The hotel itself is plush and modern, marrying a contemporary cool vibe with classic style of the building. From the moment you walk in, you know you’ve picked a winner. The 46 guest bedrooms at the Kilkenny Hibernian are chic and stylish, offering all of the modern amenities one would expect of a top class hotel. The classic double rooms, which are spacious and charming, feature complimentary WiFi, multi-channel flat-screen TVs, Orla Kiely products as well as a Nespresso machines, but, if you want to kick things up a notch, bag yourself a deluxe room with high ceilings and great views over the city along with extras like a bed fit for a king, a smart TV with Netflix, luxury robe and slippers and chocolates too. Or, go all the way to the top with one of their fabulous penthouses. Stylish and truly luxurious, they feature all of the aforementioned facilities as well as a spacious separate lounge area and a deluxe bathroom with your very own Jacuzzi. When it comes to food and drink at the Kilkenny Hibernian, you’re more than covered. If it’s a casual nibble or sip that’s calling to you, head for their Hibernian Bar. It’s open throughout the day, so whether you want to nip in for a scone and a cup of coffee in the morning, a pint with some chicken wings or BBQ pulled pork in the afternoon or a glass of wine with some chicken liver pate or an 8oz sirloin near an open fire, you’ll be catered for ably at the Hibernian Bar. They also have a great gin & tonic selection and an extensive selection of Irish whiskeys. They even do Irish Whiskey tasting experiences for the ‘spirited aficionados’. For a more formal affair, the superb Harpers Restaurant is where you want to be. Plush and utterly chic, the room is wonderfully modern take on a classic brasserie style, with attractive furnishings, leather seats and booths and a variety of stylish light fixtures. The menus at Harpers are ingredient driven and offer great signature dishes like Gambas pil pil, Paddy Kenna’s ‘Lamb Lollipops’ or seared scallops with locally sourced Goatsbridge trout. Harpers also serves as popular cocktail bar with a great selection of wine, gins and whiskeys. So whether you’ve come to town for the shopping or the restaurants, a walk of Kilkenny’s Medieval Mile, or if you’d rather avoid walking entirely and instead just want to relax in the lap of luxury, then the Kilkenny Hibernian is the Hotel for you.